I was encouraged to take up running around 4 years ago when I was working at an IT start up company with several enthusiastic runners for colleagues, including a triathlete and even an Ironman. My main focus was to be able to run 5k and, ideally, just under 30 minutes. One year later I achieved this. I carried on running on my own for another year but without any goals I found myself stagnating and my limited number of running routes started to feel rather lonely and repetitive. Several people suggested I should join a running club but I initially hesitated, as I didn’t think I was up to running 10k and especially at club standard. Eventually, about 2 years ago and 2 years after I initially started running, I plucked up the courage and turned up, rather sheepishly, to the Sandhurst Joggers’ Tuesday evening session, having said to my husband ‘well I’ll go along and if I don’t like it I won’t have to go again!’. Well, the rest, as they say, is history. I was immediately made to feel so welcome by Mike, Roy and the rest of the runners and I started to make weekly appearances, gradually improving and working my way from the back of the medium group towards the front. After a few months I was starting to feel like I was ready for a further challenge and I decided to increase my running to twice a week. To do this I started running with Patrick’s Monday group and what was then Fiona’s Wednesday group. At first, I found Monday’s run to be a real stretch but everyone was so encouraging and with a great deal of banter I gradually found myself improving. A few weeks later I was encouraged to try the Friday night’s track session and I added a third night to my training schedule. Again, at first I found this really tough but I’ve gradually found myself improving and I now really enjoy this session (mostly). Patrick, being the Mr Motivator of Sandhurst Joggers, started to encourage me to put in for some races and eventually I nervously agreed. Before I knew where I was, we were both entered for the Woodley 10k and the first of the Yateley 10k series. Just when you think things are going well, I found myself unable to run for nearly two months due to a nasty bout of food poisoning, followed by a painful calf injury sustained almost simultaneously. I felt really guilty as I was forced to leave Patrick running on his own at the Woodley event and I also had to postpone my Yateley entry to the last one in August. I just had to hope I would be back to fitness in time to be able to run it. Luckily for me Carl Bradshaw was on hand and helped put me back together. I joked with Jim Laidlaw that I would come back stronger than before. Once Carl gave me the go ahead I resumed running under strict instructions of starting with a gentle 3k jog and then if all went well to increase my run out each time by1k. One week before I was due to run the Yateley 10k I was ready to try the distance and, once again, joined the Tuesday middle group and completed a very gentle 10k route. I cannot explain how nervous I was when I was waiting to start my first race but Sharon Burfield was on hand and advised me to pretend it was just a normal Monday night run which really helped to settle me down. Once out on the road I thoroughly enjoyed my first 10k race experience and it was so lovely to be out running again. The local crowds coming out to support really did lift me. I was over the moon once I’d finished the race and achieved my first PB with a time of 55:23. Since then, I agreed to run at the Bedford Road relays as the SJ’s ladies team was a person down but apart from that I haven’t entered any timed events as I was finding the thought of them quite stressful. 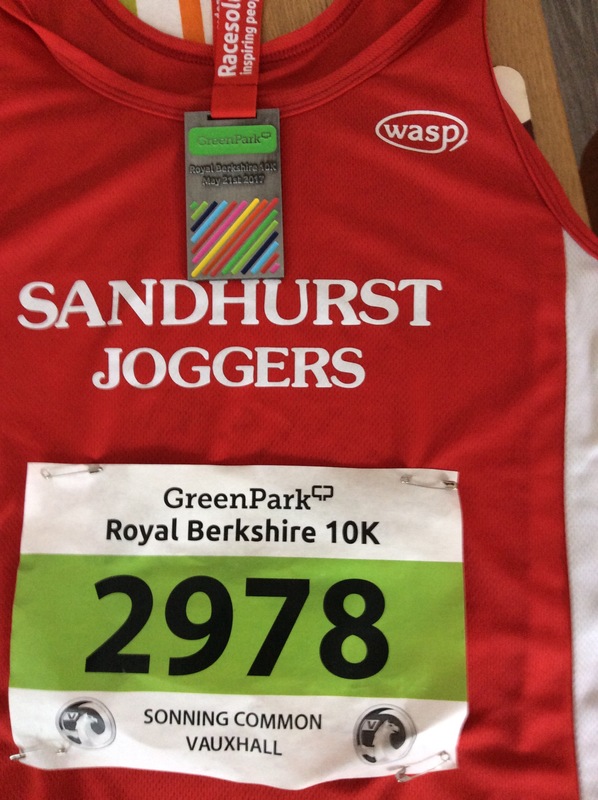 However, following lots of encouragement from various Club members over the last few months I found myself agreeing to run a 10 mile race at Easter and also put in for another 10k at Reading Green Park to see how much I had improved. I then found out I had also been granted a Club place at London Vitality 10k for the following weekend too! I thought I didn’t do races! Having completed my first 10 mile race I was hoping the 10k would feel quite a bit easier but I wasn’t sure how it would go as I haven’t been able to run as much as I would have liked over the last few weeks and some of my runs have been gentler than I had intended. Having completed the 10 mile race at Easter I thought I’d feel quite calm but when I arrived at the Green Park Business Park I actually felt more anxious than I did before the 10 miler. Initially I thought I’d just go for a comfortable but hard 10k run in preparation for the London race the following weekend but as the adrenaline started kicking in whilst we waited in the starting pen I decided to tuck in behind the 50 minute pacer and see what happens. The first few km’s went by and I felt quite comfortable. We reached the 5k mark and I realised I’d completed this faster than my 5k park run pb! Hang on in there I thought but I was starting to feel tired and thirsty. It was getting quite hot out on the course and I was very pleased to come across the two water stations as we passed them and I also slipped a jelly baby into my cheek at some point to help keep my energy levels up. As I hit the 7k mark my pace slowed slightly and I could see the 50 minute pacer starting to disappear into the distance. Keep going, I thought, not much longer, you’ve done 10 miles before, you can do a 10k! As we turned off the lanes and back onto the Green Park Business Park, I could feel the end was in sight. A welcome sound of music and cheering helped spur me on and I gradually picked up my pace once again. I was so pleased to cross the line but had no idea of my time and was genuinely too tired at that point to care. As we made our way home I checked my watch and was amazed to see my watch time as showing 50:30. I was even more pleased when the chip time came through as 50:24 – a whole 5 minutes faster than my first 10k last August! What have I learned? So far on my running journey I’ve learned loads but I now realise you don’t always need to push yourself too hard as sometimes gentle run outs are just as beneficial; you don’t need to run too much immediately leading up to a race; you shouldn’t increase your running distances too much in one go; you should stretch regularly and get sports massages before things go wrong; I definitely still need to learn how to fuel properly for a race to limit dehydrating but most of all I have learned I can do it! Finally, a massive thank you to everyone at Sandhurst Joggers who have encouraged and supported me over the last couple of years as I couldn’t and wouldn’t have done it without you!